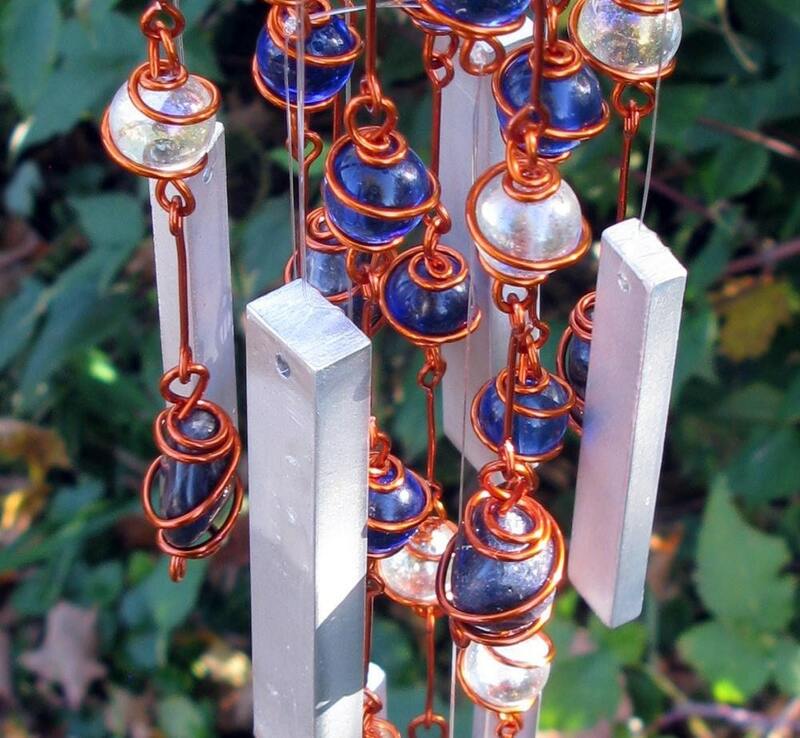 This unique windchime features a mix of 72 crystal blue and iridescent clear glass marbles, individually hand-wrapped in solid copper wire with an enamel finish (to retard tarnish). Plus, the top frame is solid aluminum so there's nothing to rust. It is accented with 8 nuggets of polished Blue Aventurine. The 8 aluminum chimes are pieces of industrial scrap. They are the discarded ends left when a manufacturer cuts flat stock to length. I clean them and drill a hole but, other than being spiffed up a bit, they are exactly as they came off the line which makes every chime unique. These little cast-offs make a gentle sound (think raindrops, not monsoon) so they won't disturb the neighbors! Metaphysically, Blue Aventurine is believed to encourage open & honest communication. 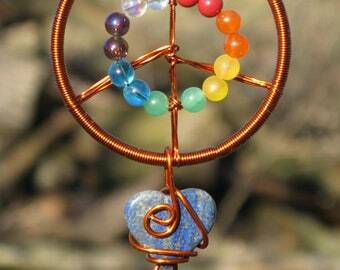 It is thought to help honor peace & caring for others plus act to calm anger & irritation. It is also believed to balance male/female energy. Every chime comes complete with a "cheat sheet" that summarizes it's metaphysical properties. The sizes and shapes of the Blue Aventurine nuggets will vary from windchime to windchime. To see more of my chimes, visit https://www.etsy.com/shop/tapestryarabianfarm?section_id=5359119&ref=shopsection_leftnav_5. This chime is ready to ship and will be mailed USPS Priority Mail within one business day of payment.